Stella is a brand new (2018) Lagoon 42 with 4 cabins and 4 electric heads, 1 bow cabin and with generator and A/C. Lagoon’s newest 42′ cruising catamaran is both curvaceous and sleek, not to mention fun to move (or lounge) about. This freshly designed Lagoon42 has replaced the Lagoon 420. The deck is designed for easy walk-around from one end to the other. The transoms are wide enough for easy boarding from a dock or dinghy, and just two low steps lead up to the cockpit. In the cocpit you will find a large teak cockpit table to starboard, which will seat eight. A small lounge seat is on the port side and another small seat in front of the dinghy davits. 4 steps lead from the cockpit to the helm station, which has plenty of room for two people to steer and trim the sails.The boat can be easily sailed singlehanded, as everything—from the B&G multi function display to the Spinlock rope clutches—is within reach of the steering wheel. Steps also lead up to the coachroof for access to the boom or the integrated sun pad. The saloon is on the same level as the cockpit and is separated with a 3 glass sliding door. The U-shaped galley offers a three-burner stove, a single sink, refrigeration and freezer. 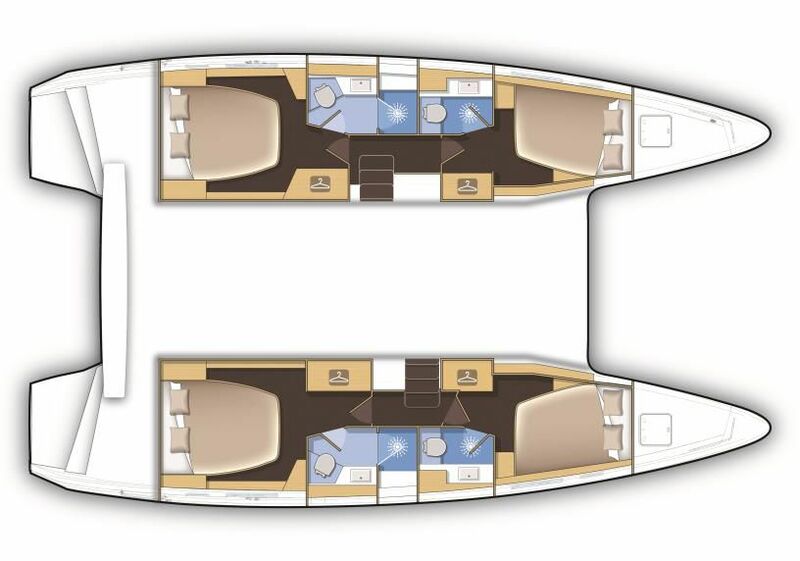 The saloon is spacious and has an L-shaped settee with bench and dining table to port and a nav station to starboard. The 2 aft cabins have a low island bed and a private head with a separate shower stall. The 2 forward cabin have a tapered bed and an integrated head/shower combination. On starboard the cabin provides access to the bow compartment which can be used as an additional single sleeping quarter. This bow cabin can also be reach through a hatch. Please note that all photos are stock photos, compliments of Lagoon.